Let me begin with an announcement: in the next few weeks we will publish the yearbook Doing STS in Europe: EASST Review 2016 – a 250 pages book compiling all the contributions to the EASST Review during last year, including the profiles of four STS groups located in Europe and four STS publications platforms, as well as dozens of reports on STS events and EASST-funded activities, including two special features: one on Bruno Latour’s exhibition RESET Modernity featuring an interview with the author and three commentaries; the second one on the EASST/4S conference in Barcelona last year featuring over to 20 reports on specific sessions and panels. A digital copy of the yearbook will be downloadable for free from our website. And you will be able to buy print copies (yes, nothing like physical objects you can hold in your hands) from conventional online retailers. But the project has also confronted us with tricky questions. First we thought: well, we would then need to give authors a free print copy, just like the one you get from any other publisher. This would also put some print copies in circulation among our core audience (you! ), who might then in future buy print copies of all yearbooks we publish, and start their own collection. But discussing the idea further a different proposal came up: we could send free print copies to STS centers and departments. The issue is still undecided and we do not know yet how we are going to handle this, but the latter suggestion made me ask myself two questions: first, have we seen in the last years an institutionalization of STS at universities and research centers? And, second, should the goal of our professional organization be to just reinforce that process of institutionalization? Thirty years ago, there were only a few STS centers around and practically the whole field was based in sociology, philosophy, anthropology, and political science departments. But has this really changed? 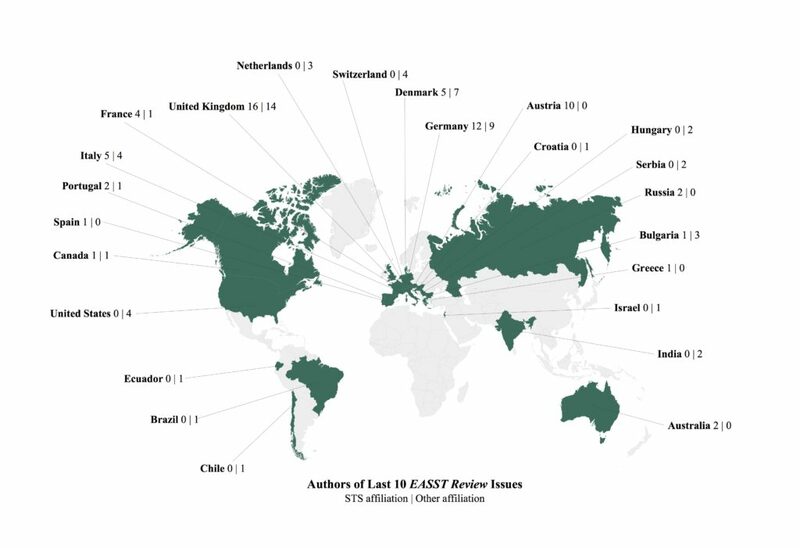 We had a look at the last ten issues of the EASST Review and the result is perhaps exactly what one would wish for a successful interdisciplinary field: an exact tie of 62 authors based or affiliated to STS departments or centers and 62 authors, for whom in their bios we mostly found other institutional affiliations. By the way, we also have 57 female authors and 67 male authors, which is not so bad either. But even if we included Russia and Israel as ‘non-European’, the percentage of authors based in non-European institutions is just 12,9%, which should maybe remind us all of the regional character of our association and its main outlet. But coming back to the question of institutionalization of STS, as reflected in author affiliations in the last ten issues of the EASST Review, we need to be careful with the prima facie positive results presented above. To begin with, we need to take into account, that in mid-2015 we introduced the section STS Multiple, where we invite STS groups and centers to present themselves. The seven contributions included in our database average 4 authors each. So, we have about 28 authors that appear listed as STS-based authors, whom we explicitly invited and encouraged to publish here. This doesn’t speak against the strong presence of STS-based colleagues, for the important question is how are we collectively performing the field of STS, not what the field is in itself. But it introduces a nuance in the result. A second consideration is how our list reflects different levels of participation and institutionalization of STS across European countries. Most authors are based in Western European countries: UK (30 authors), Germany (21), Denmark (12), Austria (10) and Italy (9). For these five countries, 58% of authors are affiliated to STS departments. The percentage appears as remarkably high, when compared with the 42 authors from the other 19 countries, of whom only 33% is based in an STS department. Taking all this into consideration, we can confirm the obvious: STS is highly institutionalized in a small set of Western European countries, whereas in the rest of countries STS is primarily practiced in the margins of non-STS institutions. We come thus to the second and more interesting question: how to act as a professional association in this context? I have really never questioned the idea that a major goal of EASST should be to support the institutionalization of STS both at universities and in national research funding agencies. It seems pretty obvious that we aim for a future in which universities have centers or departments of STS, where you can get a job in STS in most countries, and where, when you apply for funding, you don’t need to crook your research questions or methods in order to make them fit in a disciplinary evaluation committee (remember Josefine’s editorial on the presences and absences of STS in grants applications and CVs? See Raasch 2015). I certainly still believe that these are major goals for our field. I applaud the systematic support that EASST has given to the formation of many national STS associations and networks. At the EASST Review, the sections STS Multiple and Cherish, not Perish aim precisely to make visible this process of institutionalization of STS across different countries. But I think that we should equally make an effort to support a non-institutionalized STS practice, but not in order to help it to become institutionalized, e.g. to create STS centers, associations or journals, but to keep STS a minoritarian intellectual practice in the heart of social and political science disciplines. In other words, couldn’t also be the role of EASST to cultivate STS as a line of flight that effects deterritorializations of the institutions it departs from and that creates a highly experimental, speculative, but also committed intellectual space1? Or to put it differently: couldn’t also be the role of EASST to cultivate STS as an academic ‘extitution’? I really got to understand this Serresian notion through the work of Daniel López. Two references are illuminating. The first one is a quote: “Institutions fragment, disaggregate, and separate in order to make visible the distinction. To build an institution is to constitute a Cartesian space, clear and distinct […] In contrast, the extitution is a social ordering that does not need to constitute an ‘inside’ and an ‘outside’ but only a surface in/upon which a multitude of agents connect and disconnect” (López 2006). As López further explains in a blog post from 2014 entitled ‘There is no extitution, but modes of extitutionalization’, an extitution is not just a different type of institution, one that could be more heterarchical or with flexible boundaries and that you can point to with the finger, but rather a process of deterritorialization or extitutionalization affecting institutions, contesting power arrangements, and opening up provisory spaces for establishing new connections. Looking at the incredibly generative history of STS in the last 40 years, my sense is that this didn’t occur in spite of, but rather thanks to its lack of institutionalization; lack of institutionalization that has pushed STS scholars to always invent new connections, new vocabularies, new research objects, and new political commitments2. Might it be that herein lays the crux and paradox of our field, always in need of simultaneously striving for institutionalization and extitutionalization? 2 See, for example, Tomás Criado’s (2017) reflections on his personal experience in both highly fluid and highly institutionalized STS spaces. Estalella, A., Ibáñez Martín, R. & Pavone, V. (2013) Prototyping an Academic Network: People, Places and Connections. Three Years of the Spanish Network for Science and Technology Studies. EASST Review 32(1): 4-6. Raasch, J. (2015). STS in Grants and CVs: Dealing with Differences. EASST Review 34(4): 4-5. 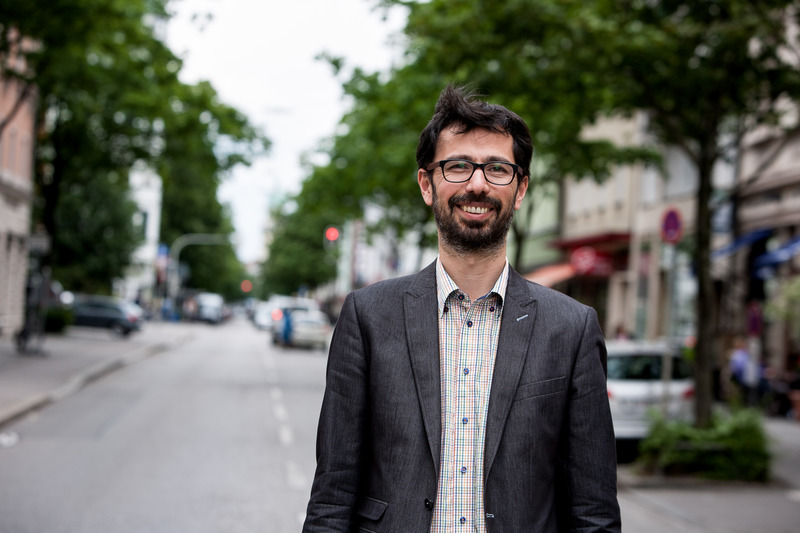 Ignacio Farías is assistant professor at the Munich Center for Technology in Society and the Department of Architecture of the Technical University of Munich. His most recent work explores the politics of urban environmental disruptions associated to tsunamis, the heat-island effect and environmental noise, as well as the challenges of technical democratization, especially in the context of smart city projects. He is the editor of EASST Review. Previous ArticleFormer Council Members: Parting WordsNext ArticleFrom a politics of difference to a politics of sameness, and back!